I think we have to think a little bit outside the box. If you think it … is of interest, come forward with your ideas and we’ll take a look at it. What’s interesting about this is that 90% of it is already being worked on by Council or the city Administration, most of it wouldn’t cost anything, and none of it address the fundamental problem that vehicle density has outstripped capacity across much of the city and transit alternatives are not sufficient. Which brings me back to Rob Ford. While you may be tempted to dismiss Tory as just another doe-eyed “cares about the working man” fiscal Conservative, he has differentiated himself from Lord Crackington quite effectively. Rob Ford’s politics are like his appetites (that is not a fat joke): he stands for everything and anything, and will take it all regardless of rules or fairness. Tax Hikes? Sure, who doesn’t love tax hikes. Improved Service? Of course, it’s not like we need taxes to pay for them! Congestion? Take a few streetcars of the road and we’ll have plenty of room! John Tory on the other hand is the man who offers nothing but a polite tone of voice and a surplus of salmon coloured shirts. The plan he provides can be paraphrased as “We’ll do everything and anything, except for improving public transit or generally investing any money in infrastructure whatsoever.” I mentioned this on Facebook, but this is as much a ‘plan’ as asking your girlfriend “Hey, do you have plans on September first” is a marriage proposal. His plan is to do a bunch of incremental, small scale things which for the most part make sense but are already being implemented. In the same way that you play a musty old Bill Harvey record to help grandma relax; he offers mild platitudes and comfortable nothings to distract from the complete absence of anything substantive to say. 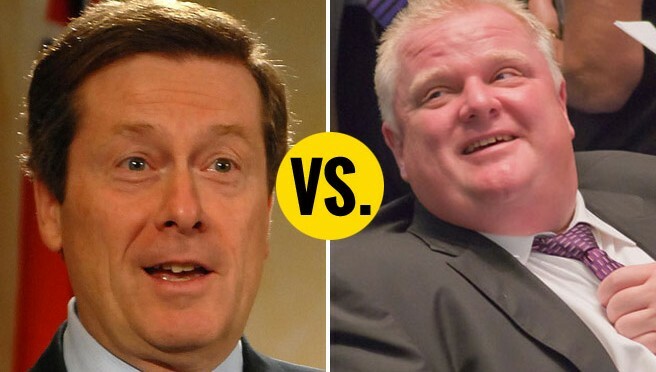 And in that way he is very different from Rob Ford (but no less dangerous).